When it comes to keeping a healthy smile, many people face obstacles that can prove to be more of a menace than they may have thought. Californians who are missing teeth face a number of risks that can impact their smile and quality of life. 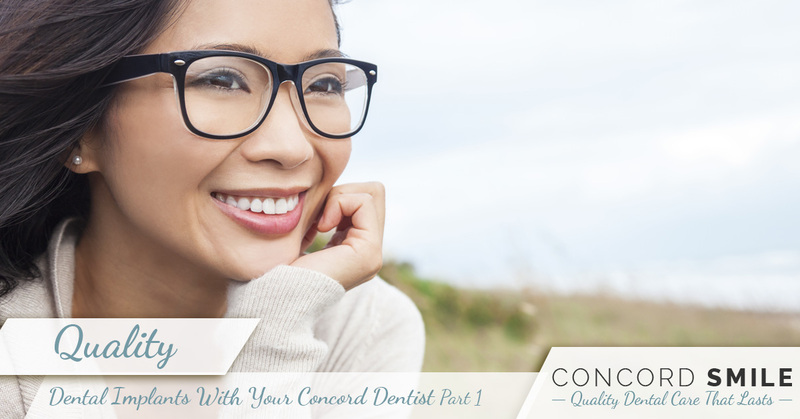 Concord Smile is here to provide our patients with quality restorative dentistry in Concord. Our experienced professionals will take the care and time necessary to produce the best possible outcome for your health, providing a wide range of services. One area of expertise revolves around dental implants and the benefits that they can provide. Today, we’ll begin to look at what a dental implant entails, as well as why it is so necessary for those with missing teeth. When you’re ready to restore your smile back to it’s former glory, feel free to contact us to set an appointment! Simply put, a dental implant is a man-made tooth root that is installed directly into the jawbone as a replacement for a former root. Unlike organic roots, implants are constructed of titanium materials to avoid decay. While traditional dental bridges are made to last up to a decade, dental implants are able to last a lifetime when adjusted and cared for properly. Why are Dental Implants Useful? When you lose a tooth, your jawbone will begin to resorb, in essence deteriorating the facial structure and causing more long-term issues. Roots that are attached to the bone will promote bone growth and regeneration, whereas the opposite will lead to complete disintegration. Aesthetic motivations are also a major part of dental implants, as this procedure can allow the installation of a crown in order to create a fuller, healthier smile. Implants are also useful for securing dental bridges as well. You can gain a lot of benefits from this procedure, which is why it’s helpful to talk to your local dentist for assistance. If necessary, the damaged tooth in question is removed. You will go into surgery, where our experienced techs will install the implant. Healing time will now happen, which can take between two and six months to complete. We focus on promoting osseointegration, or the the process of the jawbone fusing and binding with the titanium implant. When ready, we will measure and fit an abutment. This middle piece will look like a cut-down version of a tooth that is ready to receive your crown. The abutment connects to the implant and sits securely for the crown installation. The new crown will be either cemented or screwed onto the abutment. When fastened with a screw, the dental crown will be filled in with a composite material to produce a seamless finish. Performing a dental implant is no quick and easy process, yet it can prove to be a major step toward restoring your smile. Next time, we’ll look more into the risks and benefits of this procedure. Concord Smile is proud to serve our city with comprehensive dental services for patients of all ages. If you’re considering restorative dentistry in Concord, be sure to contact our dentists today to schedule your appointment!